HE BIGGEST LITURGICAL PROBLEM WE FACE — the most fundamental problem in Roman Catholic liturgical music is the prevailing misunderstanding of its very purpose. For example, how many clergy and liturgical musicians know what the propers are? Again, this is not a criticism! They have not been catechized. Our secular culture and our acceptance of it in the context of the sacred perpetuate misunderstanding. This is compounded by the rejection of our traditions. The rejection of our traditions leads to the notion of the Mass being up for personal interpretation. Such interpretation (a “Tower of Babel” in which individuals speak their own language but do not understand each other) leads to a systemic breakdown of the liturgy, which can bring about far worse than simple “misunderstanding.” The fundamental purpose of the mass then spirals out of control, leaving the sacred mysteries as secondary to personal desires. Sadly, this is not only common, but celebrated. To illustrate that point somewhat, I often receive well-intended compliments that “the music was a wonderful addition to the mass.” Addition is often the key word. I politely, say “thank you” and do not dive into the Church documents then and there. But the prevailing notion of sacred music is that music at mass is there simply for its own sake. This can be a problem in any style including ambitious classical music, e.g. the Viennese masses of the late Nineteenth Century. Whereas, singing the mass, i.e., the acclamations and dialogues, the psalms and their antiphons, litanies, etc., is to sing the Rite itself – just as the cantor sings the Torah, an ancient practice as old as the Torah itself and reintroduced by Ezra after the Babylonian Exile. ITH REGARD TO INTERPRETATION of Vatican II, let’s forget about Sacrosanctum Concilium. Forget Pius X’s 1903 Motu Proprio, Tra le Sollecitudini (“Instruction on Sacred Music”). Forget Archbishop Sample. Instead, let’s examine the 2007 US Bishop’s document Sing to the Lord: Music in Divine Worship. (SttL) We will see that in places, it too reads like a “foreign language” in its clear understanding of singing the Mass and not just singing at Mass. For example, with regard to the musical hierarchy of importance in what should be sung at mass, SttL is full of surprises! Why? Because of the pervasive misunderstanding of the very purpose of sacred music. 2 •	Antiphons and Psalms – this is in reference to not only the Responorial, but the Propers – the Entrance, Offertory and Communion Chants and their corresponding psalm verses. It comes as a shock to most everyone that hymns and songs are considered least important while singing the very texts of the Mass are of the highest priority. We are also reminded that hymns are primarily the domain of the Divine Office. This is all very counter-cultural and revolutionary, but only because we have forgotten our traditions. O, WHAT DO WE DO? Change everything all at once? When changing the culture, it is often best to look for progress, not perfection, at first. 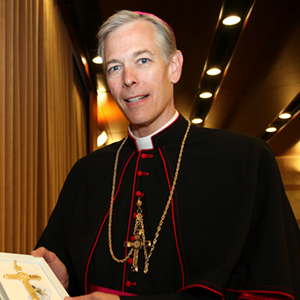 However, we must not be afraid to speak boldly about the dignity of the liturgy, as Archbishop Sample does in this pastoral letter. Furthermore, we must act with conviction as well. People must experience for themselves how their prayer might evolve and be nurtured through singing the mass, rather than reading words on a page on how this is accomplished. As Ezra brought back the singing of the Torah after the Exile, may we too bring back the dignity of the Mass. The Mass is our greatest praise to God. Let this prayer be as beautiful as we can make it.